Gatorland is a 110-acre (45 ha) theme park and wildlife preserve located along South Orange Blossom Trail in Orlando, Florida. It was founded by Owen Godwin in 1949 and has been privately owned by his family since then. Billed as the “Alligator Capital of the World,” Gatorland features thousands of alligators and crocodiles, a breeding marsh with boardwalk and observation tower, reptile shows, aviary, petting zoo, swamp walk and educational programs. The park is known for buying and rescuing nuisance alligators from trappers that would otherwise be killed for their meat and skin. The Breeding Marsh area of the park was used in the filming of the 1984 movie Indiana Jones and the Temple of Doom. The operation also has an active road show providing alligator wrestling, pythons, lizards and other animals with an informative animal talk for private parties and benefits. 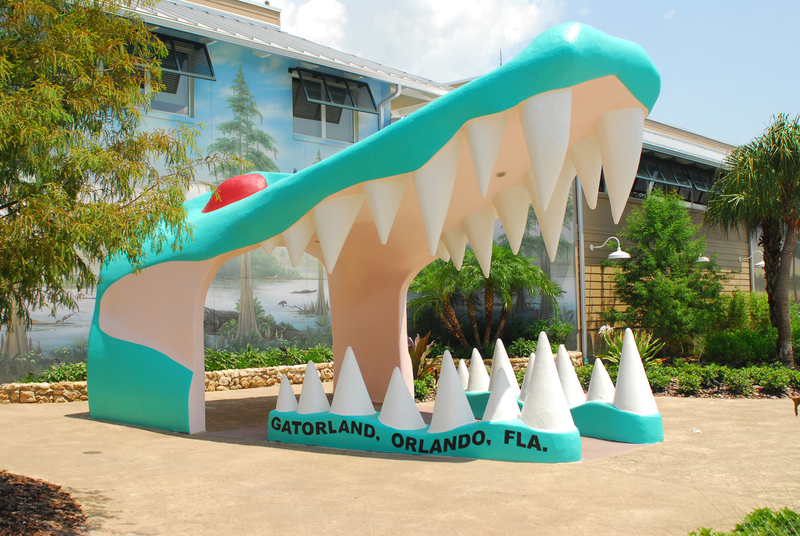 In addition, Gatorland manages the live alligator display at the Gaylord Palms resort in Kissimmee, Florida. This park also has a snakes of Florida exhibit with the snakes like indigo snake cottonmouth and rattlesnakes. The park is also known for its leucistic alligators. The Gatorland Express, known as Ol’ Iron Horse Express prior to 2001, is a 2 ft (610 mm) narrow gauge railroad attraction inside the park, which first opened in 1961 and was originally built by the Allan Herschell Company. The original locomotive was retired in 2000 and put on static display, while a brand-new locomotive built by Train Rides Unlimited was purchased and put into operation the following year. The new locomotive is the same model as the locomotive used at the nearby Green Meadows Petting Farm. An additional fee is required to ride the railroad and prior to the 2011 opening of the zip line, it was the only non-animal-related attraction in Gatorland. In the summer of 2011 Gatorland added a new attraction: a zip line that travels across a pool of alligators and past several of the existing attractions. The ride is approximately 1,200 feet (370 m) long, several stories high and for riders above 37 inches (94 cm) tall.